Frederick Tees was born in Chichester, Sussex on 16 June 1922, one of the five children of Henry and Elizabeth Tees. His father was a barber and had a shop in the town. Tees went to the Central CofE School and the Lancastrian School in Chichester. 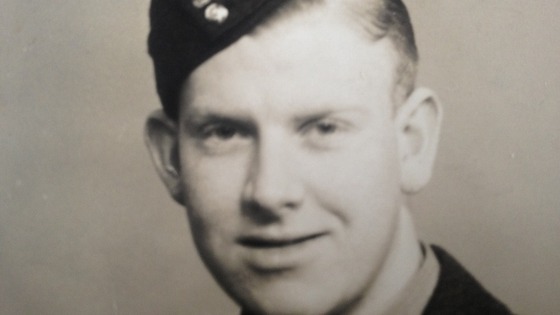 He joined the RAF in 1941 and was finally selected for air gunner training in 1942. His final training was at 1660 Conversion Unit, where he joined up with Bill Ottley and the crew who would eventually fly on the Dams Raid. They were posted together to 207 Squadron in November 1942, and took part on their first raid on 23 November. Tees and flight engineer Ron Marsden were the only two who flew on all 17 operations which Ottley undertook in 207 Squadron between then and April 1943. Ottley, Tees and the rest of the crew were transferred to 617 Squadron shortly after their last operation in 207 Squadron, on 4 April 1943. They undertook their first training flight in the new squadron on 8 April 1943. Although they normally flew in the rear and mid-upper turret respectively, Fred Tees and Harry Strange had occasionally swapped positions while serving in 207 Squadron. As the specially adapted Dams Raid Lancasters had no mid-upper turret, it is possible that both tried out the front turret of AJ-C during training. This may explain why some of the documents for the operation, including the Night Flying Programme typed up on the morning of Sunday 16 May, listed Tees in the front turret and Strange in the rear. 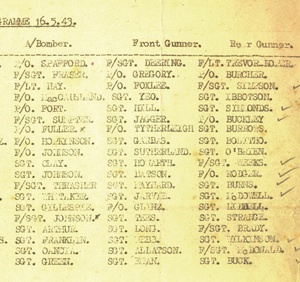 Detail from the Night Flying Programme shows Fred Tees listed as flying as AJ-C’s front gunner. When the aircraft took off from Scampton at 0009 on Monday 17 May, however, Tees was definitely in the rear turret, a decision which would save his life. Flying so low that at one point he saw a church steeple above him, Tees fired at some searchlights and gun emplacements as they crossed Holland and Germany. As they neared Hamm, a “tremendous commotion” occurred and he realised that AJ-C had been hit on the port side. His turret was immobilised and flames began to streak past it. He heard Ottley say “I’m sorry boys, we’ve had it”, and he recalled thinking “there’s no future at baling out at nought feet with three engines on fire”. Some minutes later, he regained consciousness on the ground. His turret had somehow been blown clear of the wreckage, perhaps as a result of a second explosion as the Upkeep mine blew up. He was badly burned, was quickly captured by the Germans, and spent the rest of the war as a prisoner of war. The fact that Tees had survived did not become known for some months, and so his family were told that he was missing in action. Almost a year after the Dams Raid, on Thursday 11 May 1944, his mother, Mrs Elizabeth Tees, was killed in an accident when a USAAF B24 Liberator crashed on the laundry in Chichester where she was working. It had been damaged by flak on a bombing operation over France. After the pilot set a course for it to crash into the English Channel, the crew baled out. Unfortunately, the aircraft veered off this course and crashed on land, killing three civilians. Some sources say that Mrs Tees defied instructions and ran back into the burning building to collect her handbag. Tees apparently only found out about his mother’s death on release from his PoW camp in 1945. Fred Tees became a barber after the war, the same trade as his father, with a business in Letchworth, Hertfordshire. He took part in a number of 617 Squadron reunions before his death in 1982. He was cremated in England, but his last wish was for his ashes to be scattered on the graves of his fallen comrades in Reichswald Forest war cemetery. Thanks to Mick Tees for help with this article. The survivor guilt he must have felt must have been so acute. What has impressed me so much is the absolute dignity these guys all showed. Thank you for posting this account of Fred’s life. I have just watched the Dambusters film with my 11 year old son, and have just told him about Fred. He was a friend of my fathers and would take me Fred’s barbers shop for a monthly hair cut. Short back and sides! Now very fashionable, but not in 1974!! Fred would somtimes accompany us to airshows at the Shuttleworth collection (my father was a pilot and kept an aircraft there). I remember him as a kind and friendly man who we all respected. I have always kept pride in my heart that I had my hair cut by a Dambuster.